Will he succeed? Or will the nefarious forces aligned against him prevent him from succeeding? When I began plotting THE YOUNGEST TEMPLAR trilogy, I knew that book two would be set primarily in France. There were several reasons why. First, the Kingdom of France had just unified under Philip I during the time our story is set. Before Philip solidified his control, it was essentially a land of several different baronies and duchies. Yet even though he was the French King, Philip had a very tenuous grasp on his throne. Some people just don’t like being ruled by monarchs and the French citizenry in the late 12th century was no exception. Second, putting Tristan in another strange and unfamiliar place only ratchets up the drama. He is a stranger in a strange land, forced to make his way toward England by guile and smarts. It provided a brilliant canvas for Tristan to grow as a character. But the real clincher for me came during my research on the hundreds of Grail legends when I learned about Montsegur. Or as it is often called “The Grail Castle.” If you Google Montsegur you will find a picture of it, perched high upon a mountain top in the southern Pyrenees. It is a dramatic setting for any story and when I dug into its history as a central part of Grail legend but also as a Cathar stronghold, I knew it was going to play a significant role in The Youngest Templar: Trail of Fate. I can’t really say too much more without giving away a large portion of the novel. Let’s just say there are many different legends surrounding Montsegur and I have reworked many of them into the story. I hope you’ll enjoy it! If you haven’t read Book 1, you should probably read it first. Download the Reading Guide for Trail of Fate. As a child, I was fascinated by the stories and legends of the Middle Ages, particularly the Third Crusade; the time of Richard the Lionheart, Robin Hood and Elinor of Aquitaine. I loved the high adventure, the epic battles, and the political intrigue. When I began writing, I knew I would set a book during this period. There were just too many great stories. When I was in college I first became familiar the Knights Templar. A monastic order first founded in 1104, they were first given the duty of protecting pilgrims on the roads to Jerusalem. Because they were quartered in Solomon’s Temple, they became known as the Poor Fellow Soldiers of Christ and King Solomon’s Temple, or simply The Knights Templar. Their numbers grew and so did their influence. In a short time, some could argue the Knights Templar became the most powerful and influential military force in the Christian world. Much of this has to do with the enormous wealth they amassed. Where did this great wealth come from? That is one of the great historical mysteries. Shortly after arriving in Jerusalem the Knights began a massive excavation in the Temple. What did they find beneath one of the most holy places in the World? No one knows. Perhaps it was the Holy Grail. Maybe it was the One True Cross or the Lost Ark of the Covenant. It is this mystery that has confounded scholars and conspiracy theorists alike for hundreds of years. So in this world, I set my new novel THE YOUNGEST TEMPLAR: Keeper of the Grail. The hero, Tristan becomes a squire to a Templar Knight and during a critical battle in the Holy Land he is given the Holy Grail and ordered to return to England for safe-keeping. Along the way he is pursued by Saracens, spies and secret agents of the crown. It’s full of action, adventure and as I always insist, stuff blowing up. 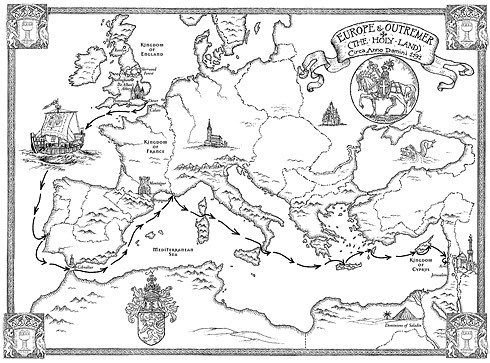 This map appears in the end papers (inside the back cover) of The Youngest Templar. Hint: click the map to see the much bigger pdf version. This 4-page download is a great resource! An interview with Mike, some info about him and the book, info about the illustrator, questions for readers to consider and discuss, and a list of projects that span the curriculum in addition to Reading: Writing, History, and Art. 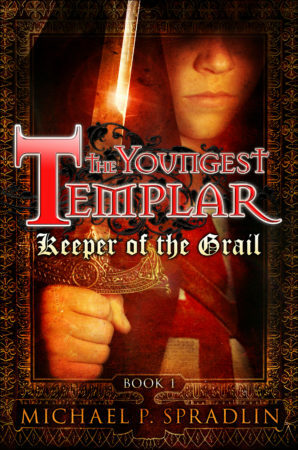 The Guide for The Youngest Templar: Keeper of the Grail was created by was created by Tracie Vaughn Zimmer, a reading specialist and children’s author. 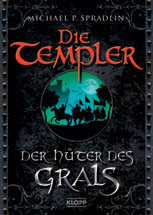 The German cover for The Youngest Templar: Keeper of the Grail. For even more things German, click over to Michael’s blog and watch the German trailer for The Youngest Templar. The Australian cover for The Youngest Templar: Keeper of the Grail. The British cover for The Youngest Templar: Keeper of the Grail. The French cover for The Youngest Templar: Keeper of the Grail. The Greek cover for The Youngest Templar: Keeper of the Grail. The Finnish cover for The Youngest Templar: Trail of Fate. 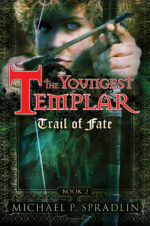 The Australian cover for The Youngest Templar: Trail of Fate. The British cover for The Youngest Templar: Trail of Fate. 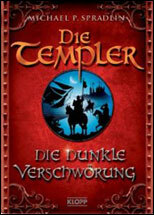 The German cover for The Youngest Templar: Trail of Fate. See what this young student from Missouri had to say about the very first book Keeper Of The Grail. View Michael Spradlin’s is interview about his book, The Youngest Templar: Keeper of the Grail. This is Part One of the interview. 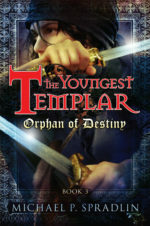 View Michael Spradlin’s is interview about his book, The Youngest Templar: Keeper of the Grail. This is Part Two of the interview. Learn about the Knights Templar history, characters in the book, Crusades and more by visiting the website. Let the fighting begin! The deadly action, uncompromising in many of its descriptions, may take center stage, but Spradlin smartly doesn’t neglect story. Tristan is given an immense challenge and responsibility and meets new friends, whose names clever readers will find familiar. The stirring saga ends with a true cliff-hanger, priming fans for the next installment. I found Keeper of the Grail an engrossing adventure. Spradlin weaves authentic bits and pieces of the history of the Crusades into the story, placing Tristan in the middle of the capture and recapture of the city of Acre, by Saladin himself. Tristan is sent from Acre just as the city falls to the Saracens. Entrusted with the task of taking the Holy Grail to Scotland and the Church of the Holy Redeemer, Tristan embarks on the quest to save one of the most important relics of Christendom; a very tall task for a young boy. A masterful blend of whimsical fantasy, spellbinding suspense, and historical mystery, read it before a crackling fire and allow it to sweep you away into another world and time. A classic adventure in the making, not to be missed! Michael Spradlin is a good story teller. Even readers who do not know much about the Crusades will be able to follow along with this tale of a boy learning about himself, learning how to become a man, and learning who he really is. Tristan is a likable character who shows tremendous bravery, loyalty, and cleverness. Readers can relate to Tristan when he faces Sir Hugh, the bully. The readers will be cheering for Tristan each time he escapes another close call. This is a winner! The Holy Grail, the Knights Templar, even Rosslyn might remind readers of The Da Vinci Code, of course, and Spradlin might be having some fun playing on that familiarity… Terrific adventure, which even younger YAs can follow as they learn something about a totally different world. This is the first title in a potentially exciting series that encapsulates historical fiction sprinkled with intrigue, tied together with a plot that keeps the reader turning pages… I think this will be an easy sell in any library. Highly Recommended. Adventure quest at its best. Tristan is a hero to remember. Readers will be dying for the next installment. Everything is done with just enough tension and description to spur the story along—that’s the mark of a great storyteller… Run out and grab a copy of The Youngest Templar for all of the young readers on your holiday list. It will be one book that will launch readers into an adventure that they’ll be fantasizing about for a long time! The Youngest Templar is a rollicking medieval adventure, full of mystery surprise and danger. The young hero is a wonderful character, smart, loyal and believably brave. I can’t wait for more! Bit by bit the author brings in the characters who will be come members of the legendary Robin Hood men along with the Saracen Maryam. All this makes for great reading that will capture the imagination of adolescent readers as they eagerly await the new adventures to come. This book is perfect for history or action/adventure fans. It accurately depicts the happenings of the Crusades while adding an interesting story into the mix. For this, I give it 9 out of 10. The Youngest Templar: Keeper of the Grail is terrific–it’s got great characters, cinematic action, and an almost magical way of making history come alive. Spradlin also has a deep appreciation of the Templar’ spiritual and sometimes tragic crusade to free the Holy Land, as seen through the eyes of a boy on the brink of manhood. I really enjoyed this book. “…packed with one exciting event after another… The Youngest Templar series is sure to grab the attention of middle grade and teen readers. They will speed through this first book and be anxiously awaiting the second, due out next fall. I cannot recommend this book highly enough. Not only is it a fast-paced and enjoyable read, it is one of those rare books today that hearkens back to a time when books for boys were about masculine things, and unapologetically so. Some good Dan Brown style adventure and mystery. All the right ingredients: The Holy Grail, Knights Templar, and as added extras, Robin Hood and Maid Marian. Though I am called Tristan, I have no true name of my own. It was Brother Tuck who found me on St. Tristan’s Day, nearly sixteen years ago. He is a kind and gentle man, but a ­deaf-­mute, and unable to even write down for me how I came to be here. The abbot, a much sterner sort, tells me that I was found that August night on the steps of the abbey. A few days old at best, hungry and crying, wrapped in a soiled woolen blanket. I’m told the sound of horses could be heard riding away through the night, but since Brother Tuck was the first to find me, we know not if he saw or even glimpsed the riders. The abbot said that two of the brothers followed the tracks into the woods but soon lost the trail. So whoever left the note must consider me safe now that I am nearly sixteen. For as near as anyone at the abbey can tell, no one has ever come here and asked about or “watched over” me in any way. Perhaps my parents, whoever they are, were unable to fulfill that promise. The monks were always kind to me, but they were Cistercians and believed that one was never too young to work. I earned my keep there. However, I bore them no ill will, for the monks worked just as hard as I did. I lived at St. Alban’s for all of my life, and my earliest memories were not of the names and faces of the monks, but of chores. We were a poor abbey but grew enough crops and raised enough sheep and goats to get by. Our needs were few. There was wood in the surrounding forest to see us through each winter. The gardens provided us with plentiful vegetables, and the fields gave us wheat, which we turned into bread. If there was ever anything else we needed, the brothers traded for it in Dover or one of the nearby villages. It was a quiet and calm existence, but the work was endless. The garden was my main contribution to the abbey. Brother Tuck and I tended it from planting in the spring to harvest in the fall. Working the hoe through the soil was quiet work, and gave me much time to think. The garden sat in a sunny spot behind the abbey, and once the rainy spring was over, the weather was usually fine and fair. Our abbey was located on the travelers’ road a day’s ride northwest of Dover. There were thirty monks in service there. Built many years ago it rose up out of the surrounding forest like a small wooden castle. It was simple in its design, because Cistercians are not frivolous, believing man is here to serve God, not adorn his buildings in finery. Still, it was a comfortable place, inviting and welcoming to the few travelers who passed our way. The main hall where the brothers gathered to dine and pray was well lighted by the windows that rose high in the peaks. The surrounding grounds were neat and well tended, for the brothers believed that keeping things orderly kept one’s mind free to focus on God. Except for the forest around the abbey grounds, and a trip to Dover three years before, I had seen no more of the world—though that was not all I knew of it. The monks offered shelter to travelers along the road to Dover, and from them I heard things. Exciting things happening in ­far-­off places that made me wish for a chance to leave and see them for myself. Some told tales of wonder and adventure, of magnificent battles and exotic places. Recently, most all of the talk was of the Crusade. King Richard, who some called the Lionheart, carried out his war in the Holy Land, and it ­wasn’t going well. King Richard had been on the throne for almost two years, and had spent most of his time away from England fighting in the Crusades. He was called the Lionheart because he was said to be a ferocious warrior, brave and gallant, and determined to drive the Saladin and his Saracens from the Holy Land. The Saladin was the leader of the Muslim forces opposing King Richard. He was said to be as courageous and fierce a warrior as the Lionheart, consumed with ridding the Holy Land of Christians. Even those who said that God was on our side conceded that defeating the Saladin would not be easy. For the monks, the news from the east was of particular interest. To them, the rise of the Saladin was a signal that the end of days was near. Perhaps the Savior would soon come again. These were my thoughts, on a clear and sunny day, as I worked beside Brother Tuck in the garden. Brother Tuck was a large man, strong and sturdy, with a generous heart. Though he ­couldn’t speak, he made a soft humming noise while pushing his hoe through the soil, moving to some rhythm only he felt. He could not hear the riders approach, or the sound of horses’ hooves pounding across the hard ground, or the clang of chain mail and sword as the knights reined up at the abbey gate. Knights wearing the brilliant white tunics with red crosses emblazoned across their chests. The Warrior Monks. The famous Poor Fellow Soldiers of Christ and of the Temple of Solomon. Known to all as the Knights Templar.